Home SEND SEN Legislation My son must make his own SEN decisions? Are you kidding? If you read our guest post a week ago from Jane McConnell of IPSEA about her "Red Lights" in the draft Code of Practice, you will have noticed a section on Mental Capacity. We're going to look at this a bit today because I'm feeling a little ticked off. The Children & Families Act was passed last month, but as Jane explained in her post, Part Three is only the "skeleton of a new legal framework", to support children and young people with SEN to get the education they need. The flesh, the nervous system and circulation needed to make the skeleton 'come to life' is contained within the Regulations and the Code of Practice, the latest versions of which still haven't yet emerged from the 'secret laboratory' of the Department for Education. The first draft Code, described as 'not fit for purpose' by IPSEA, is being revised from feedback gathered during the public consultation that closed last December and, since then, from additional meetings with various organisations (including IPSEA). The new version is considerably overdue in being published, but if it's late because those bright young things at the DfE are making it as good as it can be, carefully amending to include all this high quality feedback, then that's fine with me. Better late and excellent, surely, than a hastily cobbled together version being tossed out of the DfE by embarrassed officials, running to take cover in their Sanctuary Buildings HQ, from the hoards of angry parents who feel they've played their part and, in the final analysis, haven't been listened to. The stakes are so high for families that a rubbish Code of Practice would lead to parents metaphorically (or maybe literally!) chasing the Minister, Edward Timpson, down Whitehall with burning copies of the Code skewered on pitchforks. One issue that may well bring thoroughly reasonable parents (like me) to the point of incandescent rage is if it takes away my right to advocate for my teenage autistic son. To recap, the Children and Families Act 2014 transfers parental rights to young people at the age of 16. Parents will no longer have an automatic right to be involved in decision-making about their child or be able to challenge decisions made by an LA through the SEND tribunal. Just the very idea of this shows that whoever came up with this piece of idiocy has a complete lack of understanding of high functioning young people with conditions such as Aspergers, like my sons. In a world where any child is the responsibility of their parents until they hit 18, let alone one with special needs, it is stupid beyond words to allow a local authority to exclude a parent from any decision-making role for their child. Are you kidding? For those young people whose level of functioning clearly reflects a lack of capacity as defined by the Mental Capacity Act 2005, the draft regulations do now make it clearer that their parents or a formally appointed adult representative, must be involved in decisions. However, as Jane pointed out, some parts of the Act are, "Likely to make it very difficult for adults to protect competent young people from their own immature decisions." This includes the right to bring tribunal appeals. Of course, we all know our young people are just itching to stop playing X-Box and fill in a long document for an appeal, with reference to all the supporting evidence, because they completely understand their local authority has effectively chucked them in the landfill of life chances, while they were busy happily building a brave new Minecraft world. In its present state, there is far too much room in the CoP for confusion over the subjective nature of exactly which 16 and 17 year olds are "mentally capable" of making their own vitally important decisions, without their parents being involved. And without their parents or carers present, this leaves them open to the possibility of being unfavourably influenced by the other adults in the equation - the professionals, employed by the body holding the purse strings. Take my sons for example. Both are very bright and the eldest, at 16, would certainly seem at first glance, to be quite capable of making a decision or two. In fact, his entire social needs, the reason he has a statement in the first place and is at a specialist school, stem from the fact that he has autism and ADHD and is known for impulsive behaviour, difficulty in seeing others' points of view and an unwillingness to change his opinion even if it is blatantly obvious it's wrong. Unless you know him well, as we and his school do, you wouldn't know there is anything different about him, because he has used his intelligence to learn skills to fit in. However, in a stressful situation, he will default back to his comfort zone, as many of us not on the spectrum do too. But his 'default comfort zone' for decision making is deep within the rainbow of autism. One day he will, quite possibly, learn skills to not do this. But he's 16 and taking his GCSEs for heaven's sake - isn't that enough decision-making for any teenager, let alone one with autism? This is the highly intelligent young man who thinks it's a good choice to start loudly playing the electric piano at midnight. 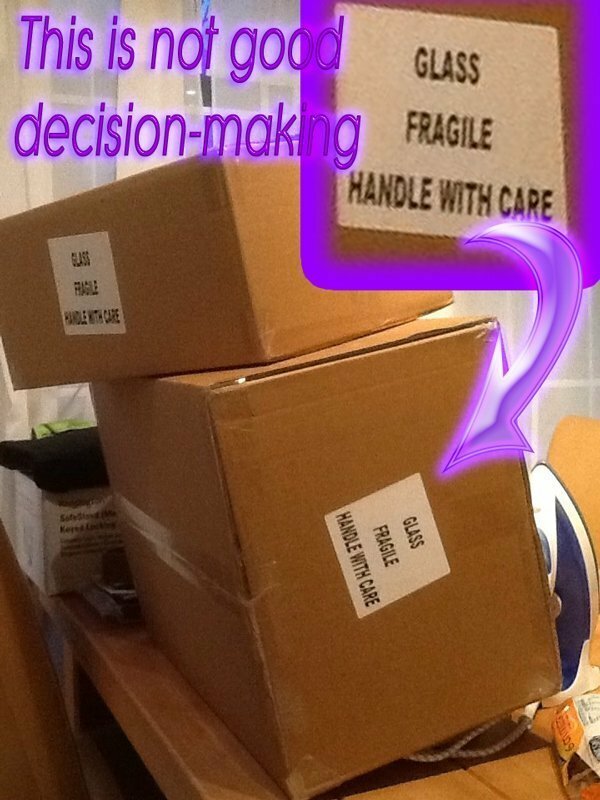 Or take this recent decision, below on where and how to stack my newly arrived boxes of glassware. On top of this, who is it that decides whether my child, whom I have known all his life, is capable of making a well-considered, important decision about his support without his mum there? Nothing was included in the public draft of the Code as criteria for adequate mental capacity or who should apply it and how. This makes him extremely vulnerable in a situation where the only adults present do not necessarily have his best interests at heart, because they're more concerned with balancing their department's budget. Guidance in the Code should make very clear that parents should automatically be presumed to be the advocate for their child if it is established that they do not have mental capacity to make decisions for themselves. In any event, it should be made clear that parents should always be central to decision-making, be kept informed by LAs and their views given due regard. Only in exceptional circumstances should they not be involved in the process and their views not take precedence over professional views. I'm not a lawyer and it needed to be highlighted to me by Jane, how this will affect not only children like mine but how greater clarity is also needed for parents of those young people aged 18-25 who definitely cannot make their own decisions. Because of complex issues like this, parents rely on organisations like IPSEA to unravel it for us and then it is up to us to act and make our voices heard. Unfortunately there has not been a public consultation on the Mental Capacity Regulations or the new wording proposed for the Code. ...and so we have not had a chance to do this. So this is me, saying, er, excuse me, I would like to be heard please. I'm sure I am not alone. I don't think the DfE has done this deliberately. I do, actually, think they want to do the right thing, but when you make things up as you go along, as has happened with the Code of Practice, there is quite likely to be a bit of a muddle at times. It just so happens that this muddle is vital to get right. And one last question, something that has puzzled me for a long time: When the Code was being written - not consulted on, but actually written - would it not have made sense to have had someone like (SEN parent & barrister) Jane McConnell or an IPSEA lawyer representing the parental view at the table too? ** If they had been involved in the actual drafting process itself, perhaps it might have produced a better document in the first place. This is what is really meant by co-production, not what has actually happened, which is consultation. Is it too cheeky to please ask the government to start practicing what it preaches? But I want to know what you think - should you be consulted on this point? *I do know some LA professionals who do this naturally and whom I admire greatly, esp. Julie Pointer of Surrey's Transition service. ** I happily stand to be corrected on this point. Oh my word! This reminds me of the difficulty, at the other end of life, of getting help while protecting the dignity of one’s elderly relatives. I sat in a (frankly ridiculous) interview last year while my mother-in-law, a formal social worker herself, gave an Oscar-winning performance of a woman able to cope in her own home, despite the fact that she had no idea where she had been that morning, what she’d just had for breakfast, whether or not she had difficulty remembering to take her tablets (she wouldn’t even have known to take them if I hadn’t been giving them to her). It was an impossible situation because I didn’t want to cause upset by stating how things really were (not in front of her), but I also couldn’t believe the complete ineptitude of the social worker’s questions. What use is it asking someone with dementia how well they cope, without – even discreetly – asking the family? Of course, if the person wants their independence (which is only natural) they will say they cope wonderfully. This blog post sounds to me like exactly the same thing! Of course there must be provision for young people to express themselves and their needs but, like you say, except in exceptional circumstances, the parents are the ones who have been looking out for the child’s interests for years on end (and will likely still have to do so long after most parents have been able to back off, so to speak). I can quite easily imagine my son needing someone to look after him, or at the least to keep an eye on him, for the rest of his life. The idea of what constitutes mentally capable must be clearly defined, otherwise the whole thing is ridiculous and could even lead to tragic circumstances. Quite agree- in exactly the same situation at both ends too. We have already been through one interview for PiP, and I had to explain to my son what it meant to control his own award. He soon realised it wasn’t a good idea. The assessor understood too- it was just form filling for her. Well, it ‘s much cheaper for the government if they let teenagers make decisions. We pushy parents tend to demand that mhs services actually help our children, while teenagers are much less likely to demand appropriate services. Absolutely terrifying. My son turns 16 in October, at which time we will be looking at his transition to college/6th form. I know he wants to stay where he is, but I also know that he is totally unable to make decisions when faced with more difficult choices. A simple example, for his GCSEs he had to choose between DT and Food Tech for one of his options. He was totally unable to do so – he said that not only could he not choose, he simply could not imagine not doing both. There was no decision that he could possibly make. Thankfully for him, the school was able to arrange the timetable in such a way that he is doing both subjects. His other choices (between Art and PE, and between History and Geography) were also not choices as far as he was concerned. Of COURSE he wasn’t going to do PE or Geography! Being in the forefront of the changes to the law is a little bit daunting, especially when, only a few months in advance of it, we have no idea of just exactly what the regulations are going to be, or what the CoP will state or “suggest”. I can only hope there is much positive use of the word “Must”. I have read about the supposed legal ramifications of “best endeavours”, but so far that has been used purely in a business context and it remains to be seen just how this will be interprested in a non-business jurisdiction. Oh, and I cannot imagine the Area Manager we are currently under changing their approach. Not only have I met the person, I have heard of other parents’ dealings with them and I am firmly of the impression that this person should be no-where near anything to do with disabled and SEN children as I have gleaned the strong impression that the person (in my opinion) might be a bigot. This is outrageous. My eldest son has AS, he has attended university where the tutors liaised fully with me as he was unable to do so – they understood the implications of ASC. It is also important to remember that often young people on the autism spectrum will employ avoidance tactics when they find something difficult/stressful. My eldest son is extremely sensible and wanted me to advocate for him – he is 20+ and I still attend medical appointments as he knows he doesn’t always understand or needs me to be assertive for him. However, my youngest son is also on the autism spectrum. He is a totally different personality and will try to avoid anything potentially stressful, including anything to do with education. He also has selective mutism so will be highly unlikely to be able to discuss his needs in the future. He has serious communication difficulties so how can he be expected to express his views? Many of these youngsters will agree to ‘professional’ opinion either because they don’t understand the implications or because they want the situation to be over and done with ASAP. This is all about saving money in my opinion, at the expense of our youngsters. I’m all for teaching our children independence but we need to be realistic when youngsters have SEN. Thanks Jayne. I think it’s more likely that it hasn’t been thought through properly. Much of the work on this has been done by clever young people not long out of University (by the looks of them). This is nice that they bring in new ideas and lots of energy (they’ve needed it with the pace of things) but a problem is that they cannot possibly know what it is like to have a disabled child – they can (and do) sympathise, but cannot necessarily empathise. I think this is one area or legislation that needs to be approached possessing a deep understanding of the issues rather than just a cerebral understanding and this has been somewhat lacking in the development of this Act. Just an example from a friend of mine, whose son has HFA and is something of a maths and computer whizz. He is approaching 16 and has demanded that his PIP be paid into his account. From the point of view of an assessor who does not know him, he is bright, articulate and his numeracy skills exceed most adults’ ability. Yet as my friend tried to explain to the assessor, if he sees a piece of computer equipment that he ‘must have’ he will just spend the whole month’s PIP on it, leaving him no cash for transport to college. Then who pays for that? I think the article is right to focus on the ability to make reasonable decisions. And for goodness’ sake, it’s right back to the basic common sense approach. Use parents as a valuable resource. They are the experts in their children. Utilise that expertise and ultimately everyone will benefit. IF, that is, your aim is to serve the child, and not your budget. IF you see the value in the bigger picture, and not immediate budget constraints or targets. BIG ifs, those. This is likely to make extremely difficult decisions almost impossible. I am one of the ‘lucky’ ones because there was never any doubt that my son had to have all major decisions made on his behalf. Young people at the best of times often tend to ‘shoot from the hip’ based on sometimes their very limited life experience and at this age where they would benefit from advice from their parents and others of course that’s the last thing they want. More able young people certainly have every right to have a voice and express their view and preferences but big decisions need to be made together with the people that know them best. Oh and in the eyes of the law they are still children at 16 so if it all goes pear-shaped whose fault is it? I would like to see this idea face a major revision in consultation with families and a minimum age of 18, no lower. Yes, you’re right Ian. No one wants to prevent young people from taking an active role in decision making, but as parents we (or the responsible adult) do need to be involved to ensure that the young person is making a reasoned choice based on understanding the facts. And to someone who doesn’t know them, it may look like they have ‘understood’ when you, as their parent, know it actually means nothing of the sort! Indeed! But it would have made so much sense, wouldn’t it? My son has Asperger’s and unfortunately was never statemented. He has chronic social disabilites, and was medicated at age 8 due to severe impulse control problems. At age 14, I queried the dosage, as he was becoming more truculent and belligerent, and refusing to go to school, etc. His psychiatrist decided to change his meds, but he had to be weaned off. When we returned to discuss medication, the psychiatrist asked him (age 14 remember), if he wanted medication. Of course, as he thought he was different, and didn’t want to be seen as different, he said no. Now, thankfully he doesn’t do marijuana any more, but he still smokes and takes an odd pint. BUT he rarely leaves the house, has lost all social skills. I was told they couldn’t force him to take meds, but my question is why was he asked at all. THIS is what happens when parents are ignored. My son is languishing in his room, and I fear for him when I am no longer here. Trish, I’m so sorry that this has happened to your son and thank you for commenting and making such a clear point. I am sure that the DfE do not want to make the lives of families more difficult and so I hope that they read these responses and think again. This is just non-sensical and another example of parents not being listened to which can have tragic consequences. Please see the campaign for Connor Sparrowhawk known as LB (Laughing Boy) on Twitter #JusticeforLB and his mother’s blog http://mydaftlife.wordpress.com to see more support for parents to be involved in their dude’s care and decision-making and issues around choice. There is widespread criticism and anger on social media about issues of choice and parental involvement. Sara’s son had autisitc traits and epilepsy and drowned in the bath in an NHS treatment and assessment unit. There were major issues prior to Connor’s death around how he spent his time in the unit, issues of choice and how his parents’ were denied a voice/involvement. You are not alone in this Tania. Our Son has PMLD and we applied to be his deputy for health and welfare and property and affairs because we realised there might be problems. You can do it through a solicitor costing around £2,000 or you can do the forms yourself and only pay the £400 court costs. Visit Court of Protection website and all the forms can be downloaded there.Also gives you idea what to apply for given your circumstance. We are now legally appointed by the court to make all decisions for our 17 year old son. We have joint and several deputyship so either of us can make decisions and if something happens to one of us the other just carries on with out waiting on courts to make another decision. It was time consuming but fairly straight forward to do and i would recomend it. You don;t need permission from the court to apply if the person is still a child. We had a doctor confirm his diagnosis and that seems to have been enough. My son overheard me discussing this with my husband and said “well, if it’s my choice they can get lost” referring to our LA…. and whilst sometimes feel the same way, I know it’s not a choice to be made in reality no matter how much insensitive ‘experts’, uncaring ‘professionals’ and ineffective ‘advocates’ we encounter on his behalf. He needs, requires and deserves help … and we are the ones to ensure he has it! He is our primary concern. Perhaps the intention is that such young people DO say no…. now that would be a real cost saver in terms of pounds but what a loss in terms of potential. Seems the present system could’ve been overhauled to ensure lawful application and meaningful sanctions to LAs that repeatedly flout legislation. However, money spent on a ‘new’ system just delays and defers problems. Parents attending our recent meeting about the SEN changes were very worried about all of the above. Yes, of course children’s views are important and nobody would want to leave them out. But they should not be paramount. How come employers are required by law to inform parents of all young people (16-18) about risks in the workplace, and adopt different standards around pay, breaks, night work etc,etc,etc for all of this group, while seeking to turn our young people with additional ed needs into fully capable decision makers devoid of teenage urges to sit about all week avouding work, responsibilty and decision making?? Get off the fence gov: ALL young people by your own law, require support, not abandonment to their own devices. Isn’t that why all YP are now schooled to 18? So what makes YP with disabilities more mentaly capable, wise enough to decide for themselves when a 5A’* 16 year old can’t deliver newspapers without a three page risk assessment, consent forms, worry and the like? ‘The writing is on the govmts own wall’ so-to-speak. Hear yourself, your own HSE and various law/regs don’t think even typucal 16 year olds are of a capable age! Well, that says everything anyone needs to know. Thank you! I don’t think it applies to those young people for whom it is clear mental capacity does not exist. Jane is saying for those young people, it increases clarity. It’s more an issue for those whose mental capacity can ‘appear’ perfectly fine but in reality should not be trusted. A quick update. When asked at a meeting yesterday a member of the team at DfE said that they had fulfilled their obligations to consult on the Mental Capacity Regulation & Code of Practice under the cabinet office rules? We have not checked this out yet but obviously will. Mental Capacity effects children, young people, parents, schools/ post 16 colleges, LAs. The views of all of these groups need to have been considered. 1. Who makes the decision if a young person has capacity to make a particular decision – parents, school/ post 16 college, LA? 2. What individual within that organisation? What qualifications? 4. If a young person is found not to have capacity, who automatically becomes their advocate? Under draft Regulations – which have been shown to a few organisations but not made public – it would be an “alternative” person. They are defined as: A representative of the YP or the YP parents, where the YP does not have a representative. 5. Who appoints the representative? If the YP does not have capacity to make a decision will they have capacity to appoint a representative? How are they protected from being “forced” to name a representative they don’t know or trust? “The Secretary of State must consult such persons as the Secretary of State thinks fit about the draft and must consider any representations made by them”. This part of the Act will commence on the 13th May 2014. The Regulations, with the Code of Practice, need to clarify these issues and any other raised. I am concerned that this can only be done by a proper consultation. Has this happened yet? Hi Jane, thanks for the update- this is clearly an issue that has raised strong concerns! Last year the Home Office amended the Code of Practice governing police detention to include 17 year olds within the definition of juveniles. This means that they now need an ‘appropriate adult’ to make sure they understand what is going on and help them to communicate with police etc. This only came about as a result of a judicial review (http://www.howardleague.org/17-year-olds-in-police-custody0/) after years of delay and prevarication by the Home Office. That judgement revolved around what was in the best interest of the 17 year old (as a child), even when “many 17 year olds do not believe they need any guidance at all. They demonstrate all the youthful arrogance of which many parents are aware”. I appreciate that these are different circumstances but I simply cannot understand how the DfE can take an entirely opposite view as the principle is surely the same? Tania – another great piece. The whole question of ‘mental capacity’ is a such a thorny issue: there seems to be no understanding that people with average IQ or above can have SEVERE impairments when it comes to planning, organisation or decision-making. It turns out my son has above average IQ, but this has only finally been captured for the first time this year as his language disorder and auditory processing are so poor that historically professionals always thought he was cognitively impaired. Once he turns 16 this year, he has a very clear idea of what he wants to do: get A levels, go to university and set up his own games company. He is also going to personally depose Kim Jong Un, marry Sheryl Cole and own three alsatians…. How does that fit on the form!!? Yes, Son2 has ambitions to invade North Korea too… must be something in the school water! It ties in nicely with the DLA/PiP’s ability to give our kids their money direct at 16. Because of course kids at 16 with Aspergers are quite able to handle large sums of money in the same way they are quite able to manage their own educational affairs (tongue firmly in cheek). The idea that families are suddenly cut off like this is very troubling and risks exposing children like my son to bad practice and exploitation in my opinion. There may well be competent professionals out there but they will not have the 16 years experience of my son as I do. They will not know how his anxiety affects him or what the triggers are for meltdowns. They will now know whether his verbal responses are reliable or not. (My son will often say ‘yes’ or ‘no’ impulsively or to shut a professional up because he can’t cope with too much verbal. Most of the time he doesn’t communicate at all even though he has speech.) Then there are the sensory difficulties, learning difficulties and the impairments in executive function that make it hard for him to plan, organise, time manage and to MAKE DECISIONS. Unfortunately there are many people who assume that because a young person has an average or above average IQ that they are capable of making decisions. THEY ARE NOT. The problem with this is that it can result in the wrong treatment or too high or too low expectations with consequences to the YP’s mental/emotional health. The real question of course is why, in this country, are we preoccupied with shutting families out? Is it because they fear us pushing for things that they don’t want to give. Sorry to sound so cynical but I fear that our children’s vulnerability could be exploited in order to dish our totally unsuitable, but cheaper, forms of support. It also, rather ironically, could go against our children’s wishes. My son does not want a stranger to advocate for him; he wants his mum and dad and that is what it should be. I am deeply worried by this and I fear for the consequences to some of our children should this idiotic part of the legislation goes ahead. As the parent of two (now adult) boys who both had some element of learning difficulties although in neither case sufficiently serious to get a statement I am really worried about this. Both my sons had high IQs and both (on a good day) would seem more than capable of arguing with anyone. If I had been in the position of parents with a 16+ child with a statement post September, I would of course have involved them in the decision making process – apart from anything else, if I had not done so I would have been met with outright rebellion. But the idea that they could manage the decision making process and necessary negotiation with the LA on their own is frankly barking. As a solicitor specialising in SEN law, I see many parents who are worn down by the process and no longer able to cope adequately despite being perfectly competent and articulate. Apply this to the young person with learning difficulties, and the idea becomes horrifying. Yes, getting deputyship is a good idea (although it may well not be possible for the bright Aspie kids we are talking about) but it is still a bureaucratic process and £400 minimum. Not everyone has that to spare and I can see real difficulties for parents whose children are bright but still liable to make impulse decisions – I still remember my oldest (ADHD) leaving university after one year because he had been told by someone he could make £50,000 a year selling kitchens. Needless to say that did not work out, just as we knew it wouldn’t, but try explaining that to an 18 year old worried about student debt! I suspect we are going to be left challenging much of the lousy drafting and analysis through the courts but that is a waste of time and public money which would be better spent on educating our kids. In the meantime, there will be many people adversely affected who are unable to be heard. The big problem as I see it is that the Government is in a desperate hurry to get everything on the statute books by the beginning of the next academic year because they are facing a general election the next year. On that basis the idea of taking time over things to get them right has completely disappeared. Any ideas for the learning disability descriptions that best fit the DfE??? As a person with Dyspraxia I must admit if my parents had tried to make decisions on my SEN needs at 16 it wouldn’t have gone down well. When I was younger they obviously understood it a lot more than me, but I think there became a point where my understanding surpassed theirs as I am the one who experiences it therefore I know my needs better then anyone else. I went to sixth form college at 16 and that’s when it was all put into my hands. I’m now 21 and at university, and although my parents still support me all my SEN needs are in my control. I know for people with Autism etc it may be different so for them I can’t comment. I think being given the independence to make my own decisions is the reason why I have learnt to cope so well. Well done for your success! I think we all want our children to be able to make their own independent and considered decisions. Even then some will be bad ones and that’s part of learning too. The point though is about parents being able to be involved when the young person needs specific guidance because their decision-making skills are immature for their age because of a special need. It’s about ensuring they make the right decision for themselves on important issues that affect their well being and having considered all the options. My son can make decisions but often they are impulsive and knee-jerk without considering consequences. He still needs my guidance to ensure he does that vital part of the decision making process too. I agree that trying to make decisions for young people without consulting them would be foolish in most cases, as well as a waste of time, as Megan has pointed out. But what we are talking about here is a proposal which could effectively cut parents out of the decision making process, so that young people would be very much at the mercy of local authorities who may well be putting forward suggestions based more on cost than what is really needed. Having parents in there as well is a big help to ensure that people don’t get taken for a ride. I have three very independent children now in their thirties, but even my doctor daughter (who has no element of special needs) still comes to me for guidance and discussion. My dyslexic son badly needed my help when his disabled students’ support collapsed at university. His initial reaction was that as he could not cope with the way some lectures were presented, he could not complete the course. Fortunately I was on hand to steer him to other possible solutions and ways of dealing with the problem. If I had not known about it as he was living at home, I can easily imagine that he might have had a quick word with his tutor, decided nothing could be done, and given up. Naturally I would not dream of telling any of my kids what to do, but we do need to be involved, just as we have to be when other decisions and actions are taken about people under 18, whether or not they have special needs. The current proposals smack of political correctness introduced as an after thought, with no consultation, and no thought to the practical implications. Omnishambles!!!! The situation is worrying as most parents continually support the SEN children throughout their Adult lives yet this goes unnoticed by the powers that be. Maybe an early challenge through the Courts would help , however in our case we ended up at Disability discrimination Tribunal for post 16 education and our local council have continually fought us . Although our ASD Son is now 22 he is still not capable of making his own decisions as has been proved recently by a cold telephone call from a well know bank offering him house insurance . Lucky we were near and heard what was going on , as we (the parents) had to stop him taking up the offer because he does …..not have a house !, so why would he need house insurance ? the offer of the ‘free pen’ seemed to be the deal clincher to our son in this case. This sort of thing happens a lot and I feel that unless you live with the person and completely understand their needs you do not know them. The parents are ‘the experts’ in the needs of the child or young adult. We live with them !! Although It seems that the current culture is that the Government ‘ know’ our children better than we do, they expect ‘reasonable’ responses from our young adults, by placing important decisions regarding their future on their shoulders, knowing that they are vulnerable and open to predators…this is course is when the young adults need guidance and support the most .Our ‘job’ as parents is to protect their interests and this is what we are doing , shame that the government does not understand that this actually means protecting , guiding and supporting or ‘making’ reasonable decisions on their behalf if they are not capable of doing so for themselves.